Babette (aka Betty) passed away Saturday, January 19, 2019 at the age of 87. Babette was born in Krumbach / Schwaben, Germany on March 20th, 1931 to Georg and Genovefa Winkler. She grew up during the war in Germany and experienced many hardships as a young girl. Her father returned home from Russia after the war, only to pass away from meningitis six months later. Betty was the oldest child in her family, and she was tasked with raising her three younger siblings, Rudi, Marianne and Erika, while her mother worked long hours at a factory. After she finished school she entered into an apprenticeship as a seamstress. At the age of 19 Betty met the love of her life, Franz, whose family had ended up in a refugee camp in Krumbach after being scattered throughout war-torn Europe. They met at a blind date dance and fell in love…..the rest is history. In 1950 Franz’s family immigrated to Canada and one year later Betty followed even though she had never been further than 20 kilometers away from her hometown. Betty left her beloved mother and embarked on the long journey to Canada. Franz met her at the train station upon her arrival and they were married in Toronto in 1952. Franz and Betty had three children, Ingrid, Robert and Karen. In 1965 they moved back to Germany to pursue a business opportunity. They worked hard and created a successful enterprise. In 1987 Franz & Betty retired and they returned to Canada where they settled in Kelowna. Betty enjoyed golfing, joined the quilter’s guild and a stitch and chat group, and volunteered at Hospice in her free time. She created several award-winning quilts and was a master in knitting and cross-stitching. Many a friend sought her advice when stuck with their knitting projects and Betty was always glad to help. She was also a great cook and baker. Her Christmas cookies and treats were second to none and will be greatly missed by the whole family. After Franz passed away in 2008, she had ten more good years. Betty spent her last three years at her condo at Hawthorne Park, where she was very happy. She was a loving grandmother to Tamara, Frank, Sabrina and Ida and a great-grandmother to Trent, Zack, Kasey, Noah and Naomi. Betty was predeceased by her parents, her brother and her husband. She was the type of person that people gravitate towards, an attentive listener and a good and loyal friend to many. A celebration of her life will be held on Tuesday, January 29, 2019 at 1:00 pm at Springfield Funeral Home, 2020 Springfield Road, Kelowna, BC. In lieu of flowers, donations may be made to Central Okanagan Hospice House, c/o www.kghfoundation.com. 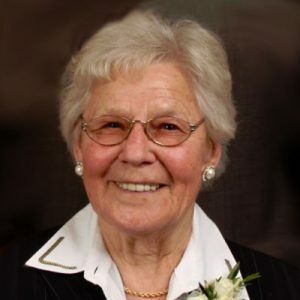 The service for MUELLER, Babette is scheduled for Tuesday, January 29, 2019 at 1:00 pm . Below you will find the map for the service location and the contact information should you have any questions.